Did you ever want to start your own food-related business? Today lots of rules and regulations affect the operation of businesses serving or selling food. A hundred years ago there were few regulations. 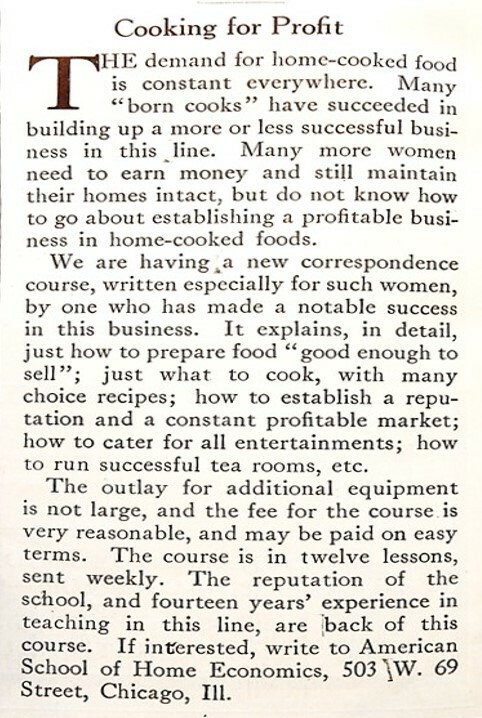 But people in both 1919 and 2019 had many similar questions when considering whether to start a small food-related business – How do you cook foods that people want to buy? What is needed to ensure that the business will be successful? , etc. Oddly, this reminded me of the advertisements for art courses that used to appear on matchbook covers. I had no idea that cooking schools also provided correspondence courses. It’s very interesting. The rules are tougher now. Even the hotdogs our swim team was selling had to have the health inspector visit. Sometimes I think that food is over-regulated today, and that it takes some of the joy out of cooking. And sharing. But, our church had a potluck years back and everyone got hep A.
Oh dear – that sounds awful. There are good reasons for food safety requirements and regulations. I won’t begin to imagine the hoops you’d have to jump through today. Today, it’s a major commitment to navigate all the regulations to sell food. It’s fascinating how ideas from previous generations morph to fit the context of current times. The regulations in Chicago were, until recently, quite severe. I’d been told that they had been put in place by lobbyists for the restaurant industry. (The kind of thing I would have scoffed at years ago, but now it’s just so plain to see that our government is nothing but business puppets.) Anyway, it used to be that you could not sell ANYTHING that you cooked in your home. You had to make whatever you were selling in a commercial kitchen. Recently, that changed, but the list of what you can make is small and specific. It’s good that small changes are being made that allows some things to be sold that are made at home. Hopefully this recent trend will continue. Must’ve been quite a blessing to the folks back then that were in search of a way to learn the ropes and give their home cooking business more credibility and how to be more professional. I like this. Correspondence course played an important role in the days before the internet. It seems there were a lot of these “earn money from home” schemes in the early to mid-1900s. I see similar ads for weaving at home in old magazines. If women couldn’t easily work outside the home, I guess it makes sense they would try to find ways to do it at home. Yes, I think that you’re right. Many women were very dependent upon whatever money their husbands gave them -and my sense is that they often were given less than they really needed to run their households. Women back then really valued any opportunities to earn a little “pin money”. Hmm. . . do people even use the term pin money any more? I don’t think that I’ve heard anyone say it in years. Food is definitely over regulated today, to the point that small businesses can hardly cope with all that is required, which unfortunately, is exactly what the large corporations aim at. It is a real shame. I agree- It makes no sense how difficult it is for small food-related businesses to comply with all the regulations. I too think food is over regulated today. When we lived in New Hampshire and had our apple orchard, we wanted to sell pies along with our apples. Our historic home was built in 1730 and the kitchen had pumpkin pine floors with boards that were 30 inches wide. We could not use our kitchen because the floor was not “a modern sealed floor”. Good grief – some regulations are so very poorly though out.